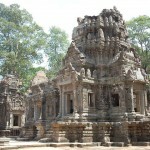 Angkor was the ancient seat of the Khmer Empire, which dominated Cambodia and the surrounding regions for centuries. 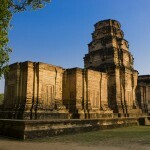 Its kings left behind an impressive legacy of cities, monuments and temples. 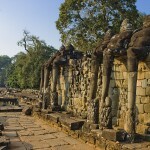 Today, the Angkor Archaeological Park is visited by some two million tourists each year. 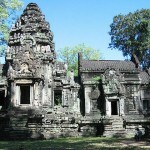 Angkor Wat (Recommended)– This is the most famous temple in Angkor, and perhaps the largest religious monument in the world. 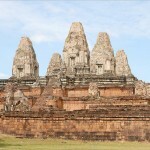 It is a truly spectacular structure that Cambodians have proudly featured in their national flags throughout their history. 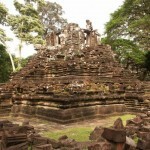 Angkor Thom (Recommended) – The last capital of the Khmer Empire, this impressive city once supported up to a million people. 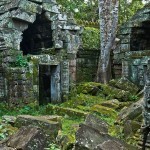 You will be blown away by its ruins and the legacy of its designers. 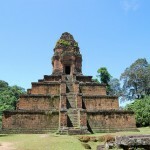 Le Grand Circuit – Some highlights include Preah Khan – a hidden treasure even though many tourists skip it – and East Mebon – a large temple mountain which looks like a miniature Angkor Wat. 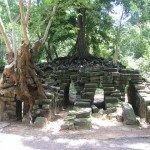 Le Petit Circuit – Highlights include Ta Keo, Banteay Kdei, Sras Srang, Prasat Kravan, and Ta Prohm. 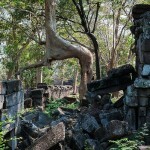 These temples are known for having trees intertwined with its stonework. 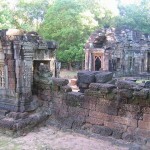 Ruluos Group – Includes Bakong, Lolei, and Preah Ko. 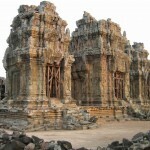 These date back all the way to the 9th century, when the capital of the Khmer Empire was Hariharalaya. 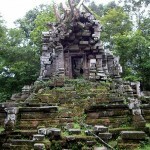 Outlying Temples – It takes some effort to get to these temples, but they’re worth seeing: Banteay Srey, Kbal Spean, Beng Mealea, and Phnom Krom. Star ratings (*) next to each temple will give you a better idea of which one you should see. You can purchase one day, three day and one week passes ($20, $40, and $60, respectively). These days run consecutively and cannot be extended. They include a digital photo taken at the entrance booth. If you arrive after 5pm, the pass does not begin until the next day, so you can enjoy a free sunset (Which is definitely a highlight of Angkor). 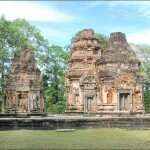 To purchase a pass, go to the large, official entrance booth on the road to Angkor Wat. 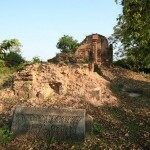 Currency – Locals accept US dollars or Cambodian Riel. For travellers, its best to use USD. It’ll make calculations much easier. 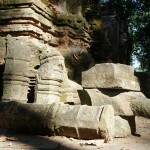 Food – In spite of an official ban on commercial activity in the area you will find random food stands in the Angkor area. With a little bit of bargaining, you can get a meal for under $2. Be careful not to bargain too hard though… you don’t want someone mad at you right before they prepare your meal! 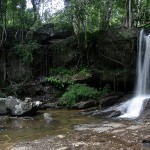 The local pineapples, mangoes and toddy palm fruit are also delicious. 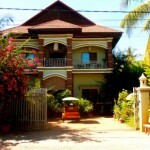 Sleeping – In response to the surge in tourism over the last two decades, various guesthouses have sprung up in Siem Riep. Your cheapest option will be to stay in a hostel, since camping is illegal. 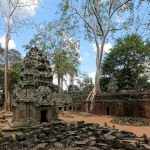 Weather Conditions – While you’re exploring the wonders of the Angkor Archaelogical Park, you will be hot and sweaty. Make sure you bring lots of water (you’ll have to pay an inflated rate if you purchase it in the park) and plenty of sunscreen. For the rain, locals have ponchos on hand in case it rains. You can easily negotiate two ponchos for $1. 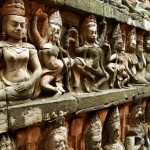 Dress Appropriately – Angkor is not just a tourist destination, it is also a site with religious significance. While they will be happy to take your money regardless of what you are wearing, it is respectful to cover your shoulders and knees. Toilets – You need to have your pass on you to get access to free toilets (locals have to pay). 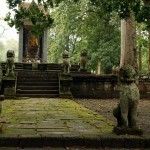 Pass – Have your pass on you at all times, since security at most temples will check it. Animals – Don’t be surprised if you see random animals, such as monkeys and elephants, wandering around the streets. Shops – To get the best prices possible, you want to negotiate with shopkeepers. Avoid shopping in central Siem Reap, since they charge the highest prices (although its still fairly cheap compared to Western prices). Rated an average 9 out of 10 from over 1,000 guest reviews from major travel sites, Angkor Pearl is one of the hotels we recommend highly. 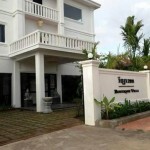 The clean rooms, fantastic service and perfect location makes this an enjoyable stay for all travellers. Only a short 10 minute walk from Pub Street, this hotel is perfect to get away from the busy night life, yet close enough for a convenient stay. 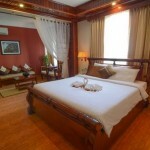 Very clean rooms and friendly staff. This is another hotel of great value. It’s a short walk to the night markets and if you’re really lazy, there are always tuk tuks nearby. 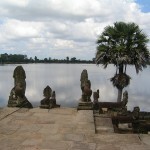 Tuk Tuks & Motos – A popular way for travelers to explore Angkor is by tuk tuks or motos. 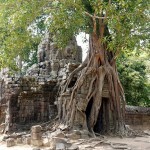 The second you step into Siem Reap, you will be approached by drivers, and from $8 a day they will take you around the different temples. Don’t be put off by their aggressive tactics; most drivers are friendly and will give you background information about the different sites. 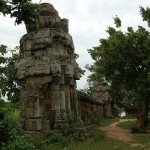 They will wait for you at each temple and drive you to the next one. 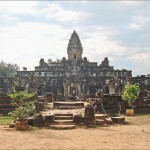 Tour Buses – If you are interested in an air conditioned, guided tour of the Angkor Archaeological Park, then paying $25-$75 per day for a tour bus may be worth it to you. 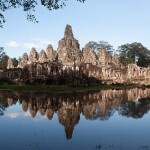 Bicycles – The cheapest option for getting around Angkor is to rent a bicycle for $1 a day. You will be sweaty by the end of the day, but you will have a lot of flexibility in terms of being able to see what you want to see. You can see multiple circuits in one day if you ride a bike. Most rental shops in Siem Riep open before 6am, which means you can get to the park before sunrise. 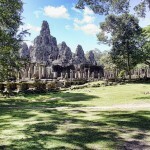 Elephants – A fun thing to do is to take advantage of the elephant rides offered between Bayon and Angkor Thom ($10). 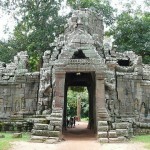 This is the traditional way of exploring the Angkor temples. A half-day mahout course is now available as well. 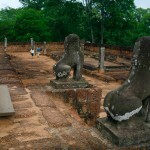 It costs $50 and allows you to ride around Angkor Thom while learning elephant commands. Cars With Drivers – For around $50 per day, you can hire a licensed driver to take you around the sites. If you are willing to take your chances with an unlicensed driver, then you can pay even less. Helicopter Flights – If you want to get a more “panoramic” view of the park, consider spending $90 at Helistar Cambodia for a helicopter tour. 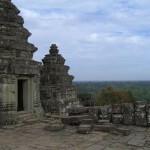 Another way to get a bird’s eye view of the Angkor Archaelogical Park is to take a hot air balloon ride. 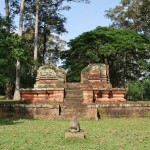 Rising 200 meters above the landscape, you will get an excellent view of all the temples and monuments of Siem Reap. 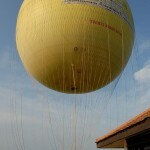 The Angkor Balloon carries up to 30 people and costs around $11 per person. 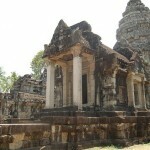 It is located next to the west side of Angkor Wat. 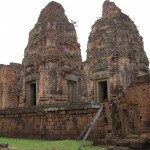 The temples that make up the Angkor Archaelogical Park were built during the “classical” period of the Khmer Empire (802-1432). 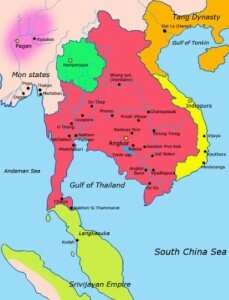 Angkor was the center of this empire. 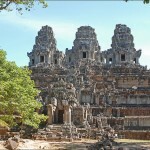 Construction on the most impressive temple, Angkor Wat, began during the reign of Suryavarman II during the first half of the 12th century. 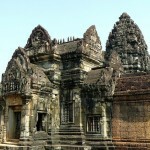 Angkor was frequently sacked by the enemies of the Khmer Empire, and in the 16th century, the center of Khmer power shifted to Phnom Penh. 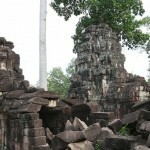 In the coming centuries, Angkor was more or less abandoned to religious pilgrims and the Cambodian jungle. 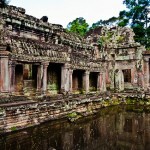 The first Europeans arrived in the 16th century, but Angkor did not become famous until French explorers sent back astonishing accounts of the majestic temples in the 19th century. 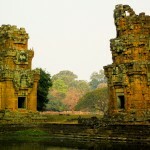 Angkor became a treasured part of the French Empire. 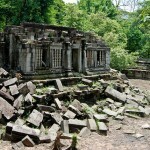 Even though Cambodia was embroiled in turmoil throughout the 20th century – most destructively during the rule of Pol Pot and the Khmer Rouge – Angkor remained intact. 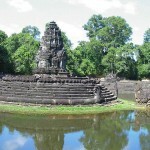 Beginning in the 1990’s, foreign tourism exploded and today the Angkor Archaeological Park is one of the most popular tourist destinations in Asia. I finally got to live out my childhood dream of becoming Lara Croft! 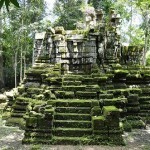 The Angkor site is absolutely incredible and certainly lived up to the expectations. We went in September and the humidity was a little unbearable, I would suggest going earlier in the year unless you enjoy sweating profusely! My experience here is really unforgettable. I went early in the morning and was able to get some great shots without people in them. The whole place is so huge. 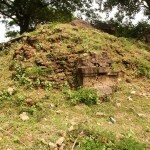 The walk around and inside the temple was a live history & religious lesson. 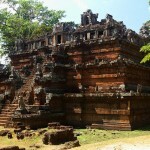 I was in awe of the architecture and carvings. What a beautiful creation at such a sheer size! There are no facilities like decent rest rooms, water, etc being provided within the complex despite expensive passes. Monkeys and mosquitoes were a pest, too. Keep an eye out for monkeys and feed them some fruit! 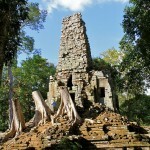 The best landmark in Cambodia. Nice to visit and wait for the sunrise. 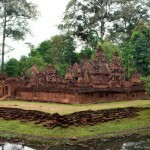 A very large complex that houses many temples. 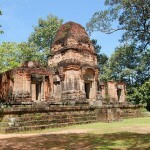 One cannot visit just one temple.You need a tuktuk to go around the complex, prices can be a bit tricky so haggle first. 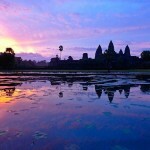 Angkor is one of the world’s wonders on the Earth! 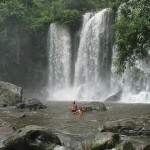 Don’t hesitate to visit it when you are in Cambodia. 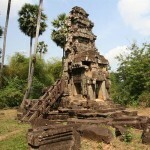 Actually, it is the reason why most tourists choose Cambodia. 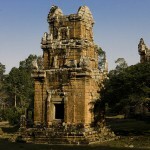 It consists of dozens of temples, and you may buy a ticket for the whole complex – for 1, 3 or 7 days. You can find what to do there during the whole week! Wow, what an incredible place! 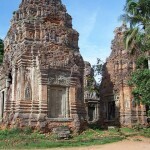 If the weather permits and you are fit and active, it is possible to see quite a lot in just one day, but I recommend you hire a guide and tuk tuk so you can learn all about this amazing historical site. We went in April when the heat was intense, so it might have been a good idea to break up the visit over two days. But we persisted and walked away in awe. Important tips: take lots of water, sun protection and a scarfe and/or long pants as in some temples and areas visitors are required to cover their shoulders and above their knees. Visiting this complex requires at least 3 days. Tickets are sold for 1, 3 or 7 days access. 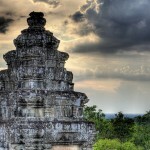 Plan your visit in advance as you need to organize your trasport there and back to Siem Reap. I took the 3 days pass and enjoyed every single minute. Don’t want to waste much in describing it as you can only get the idea once you have been there. Overall, it is MAJESTIC!